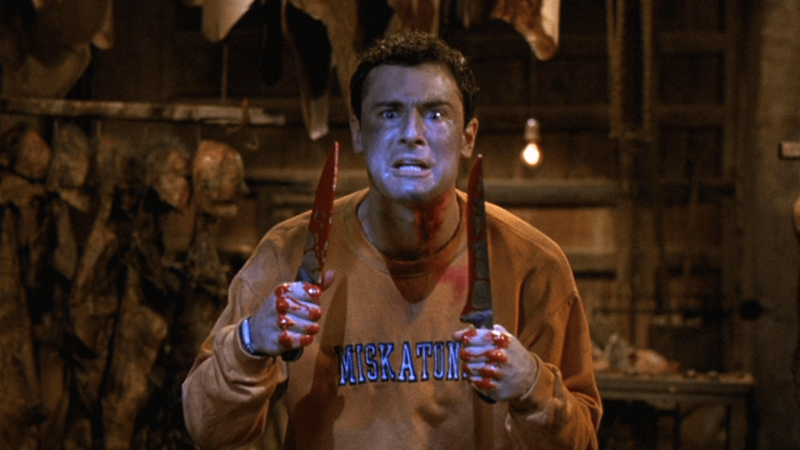 This week, I continue my look into horror films for October. Stuart Gordon’s 1985 cult classic Re-Animator gets a lot of publicity, but it isn’t the only Gordon film to take on H. P. Lovecraft. 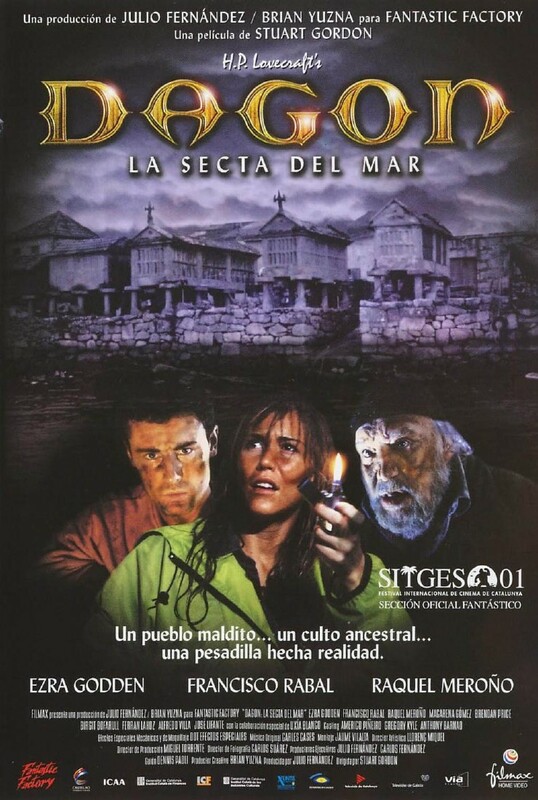 A lesser-known, and more modern, film is 2001’s Dagon—which, contrary to the title, is actually based on Lovecraft’s The Shadow over Innsmouth and not the short story “Dagon.” Even though the final film does pull some mythology from the short story, the majority of the plot is pulled from Innsmouth. The film relocates the story’s action from a New England town to Spain and follows a stock market tycoon and his girlfriend as they vacation on a friend’s boat off the coast. A freak storm crashes the boat and forces Paul and Bárbara to look for help in the seaside town of Imboca. Unbeknownst to them, but knownst to us, the town has gone through hard fishing times and resorted to worshiping a sea god called Dagon. The townspeople are slowly being transformed into fish people. Will Paul and Bárbara escape? You’ll have to watch. Will there be carnage and weird fishy-sucking sounds? Most definitely. If you’re a Lovecraft fanatic, I’m sure you’ve already heard of this film. There aren’t a lot of adaptations out there, and even then good ones are harder to find. I will admit that this one falls somewhere in the middle: neither horrible nor great, but with an excellent pedigree. Stuart Gordon is a freak when it comes to Lovecraft, but this time instead of tweaking H. P. and making him a little more campy, he tries to tell it straight. This forces the cast to act as earnestly as possible around the fish people—not an easy trick, and it’s where the film suffers. The camera almost dares the actors to turn it into camp, but they’re trying so hard not to. I will call out one actress, Macarena Gómez, who plays a priestess of Dagon. She has an ethereal look and movement to her that are very transfixing, and you can definitely believe that Paul would be both attracted to and repulsed by her during their encounter. Paul himself is played by the actor Ezra Godden, and he is almost a cipher in the film. It’s more interesting to see the things happening around him—some line readings are a little off, but then others capture the tone perfectly. Surprisingly, most of the heart of the film belongs to a resident Paul and Bárbara run into, a fisherman named Ezequiel. Francisco Rabal, in his final role, is great to watch as his town turns against him and the beliefs he was brought up in. Keen-eyed viewers will recognize the college on Paul’s sweatshirt. It’s a fun little Easter egg, except you see it almost the entire film. 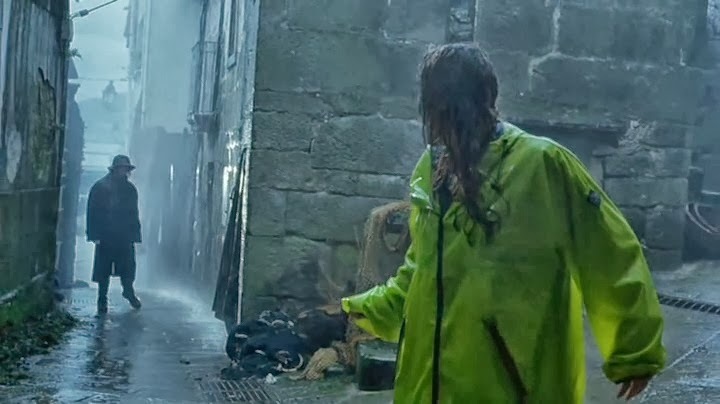 The atmosphere of the town is beautifully captured, and the whole film has a wet and slimy feel to it that the design and lighting departments did a bang-up job on. There aren’t a lot of underwater scenes (considering we’re dealing with a fish god), but the ones we do see are very well done and provide a suitable sense of scope, awe, and dread. Bárbara stands out in a yellow rain slicker. 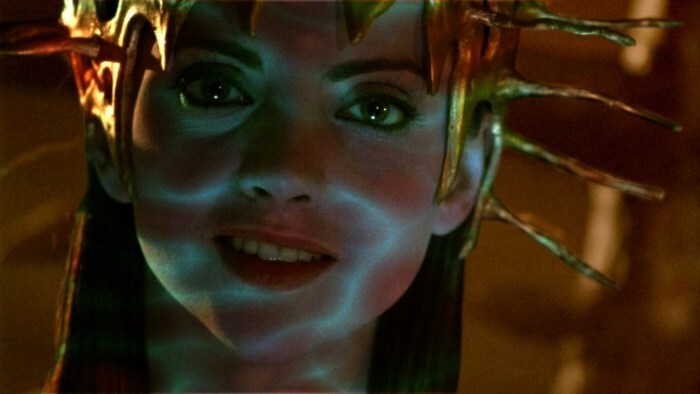 If you enjoy Lovecraft and his Old Ones myths, or Stuart Gordon’s other films, you could do a lot worse than Dagon. If the opening scene doesn’t get you, then you might not want to finish it, but for all others, enjoy. Push through some of the stilted acting and there’s a great, moody, atmospheric film here. The dark, deep ones are waiting for you. Fish people can see everything.